There is nothing like a generous serving of hot collard greens with smoked neck bones to warm both your body and soul. A traditional Southern dish, this well loved classic is an excellent source of vitamins A and C. Collard greens can be inexpensive to prepare and are filled with textures and flavors that will leave you and your family more than satisfied. Serve with cornbread to soak up all the delicious juice that comes with this amazing dish. 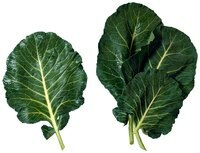 Remove the collard green leaves from the main stem and wash the greens several times in cold water. Slice collards into 1/2 to 1 inch thick slices and set aside. Saute onions and garlic in olive oil in a large pot until tender. Add chicken stock, smoked neck bones and red pepper flakes to the pot and bring to a boil. Reduce heat, cover and simmer for about 30 to 40 minutes. Place collard greens in the pot. Cover with a lid and cook until wilted, about 45 to 60 minutes. Stir occasionally. When done, taste and add salt and pepper to taste. When preparing fresh collard greens, cut into ¼ inch strips. This will help them cook faster. Make sure the leaves are a dark green color, healthy looking and not wilted or turning yellow. Do not to overcook collard greens or they will give off an unpleasant sulfur smell.